Cindy Fox had it with slicing tiny, roll-y cherry tomatoes one by one for a salad. So her husband Rob began tinkering to make his own kitchen slicer that did the job faster and easier. Rapid Slicer is the result of Cindy’s frustration and Rob’s ingenuity. The Made in the USA tool lends a hand when you’re slicing tricky foods—like grapes, cherry tomatoes, olives, and brussel sprouts. It can even help with chicken breast and shrimp, too. Depending on what you’re cutting, using a chef’s knife or serrated blade might work best. 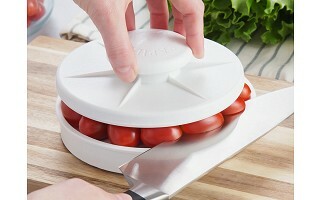 Non-slip feet give the base better grip, and the lid holds foods firmly in place so you can neatly slice through everything in one (easy) pass. How much can Rapid Slicer cut at a time? Rapid Slicer has a large capacity that holds one and a half to two cups of fruits or veggies at a time. It can also be used to slice two chicken breasts at a time. What is the best knife to use with the Rapid Slicer? A sharp chef’s knife or serrated knife that is seven inches or longer works best. Is the Rapid Slicer dishwasher safe?